Do you have enough water to start a biofuel feedstock crop? Learn how much water is required to grow and process biofuels. 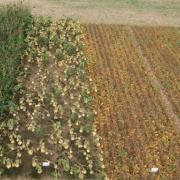 Biofuel crop research plots. Photo: Dennis Pennington, Bioenergy Educator, Michigan State University. In a world experiencing serious water shortages for meeting basic human needs and with projections for even greater human demands (Millennium Ecosystem Assessment, 2005), consuming water to produce biofuels needs careful consideration. This is especially true if water necessary for current or future human survival is being consumed for biofuel feedstock production or conversion. Locations experiencing water shortages and/or that require groundwater use at rates greater than replenishment are not likely environments favorable to sustainable biofuel production. An adequate and replenishable supply of water is a component of one feature of a farming system that can be sustained over the long term. In order for biofuels to be considered sustainable, water use in their production must be taken into account. 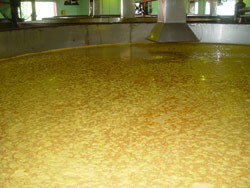 Water is mixed with ground corn in a large fermentation vat before distillation. Michael Bomford photo. Placement of conversion facilities must consider water resources adequacy for processing volumes that are planned. This consideration is particularly important in areas where aquifer recharge from rainfall is marginal or where surface water quantities and quality are temporally variable. Feedstock production requires much more water than does processing. Biomass production is linearly related to crop water transpiration (Allen, 1999). Kiniry et al. (2008) reviewed a variety of publications addressing water use efficiency of potential biomass crops. A value within the range of multiple water use efficiency estimates (5 pounds biomass/1,000 pounds water transpired) indicates that roughly 200 pounds, or 25 gallons, of water is transpired for each pound of dry biomass produced. To produce 10 tons of dry matter, assuming this water use efficiency value, would require 0.5 million gallons of transpired water. Additional water losses during production will occur from evaporation, water runoff and leaching. Water consumption for feedstock production is a viable concern related to sustainable biofuels, especially for irrigation withdrawal increases caused by production of biofuel feedstock. The BIOEN Curriculum provides additional information on water use in bioenergy production. Implications of Biofuel Production in the United States. National Research Council. 2008. Biofuels and Water Use: Comparison of Maize and Switchgrass and General Perspectives. J. R. Kiniry1, Lee Lynd, Nathanel Greene, Mari-Vaughn V. Johnson, Michael Casler, and Mark S. Laser. 2008. In: J. H. Wright and D. A. Evans (ed), New Research on Biofuels. Nova Science Publishers, Inc.